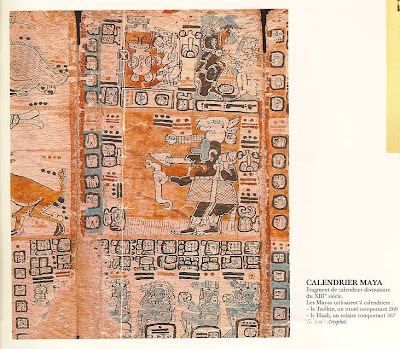 2006 - The Year of "The Red Magnetic Moon"
Fragment from the Mayan Calendar, XIII th century CE. What follows is the complete speech that I had prepared to deliver at the 'A Day out of Time' event (a Mayan Calendar celebration) on July 25, 2006 at CorUnum (The Yurt) in Victoria BC, Canada. I had underestimated the time that this speech would take, so as I ran out of time (which is a good thing to happen on a day out of time) I did not get to the final part of what I had planned to say, which was actually, as you will see, a good thing! 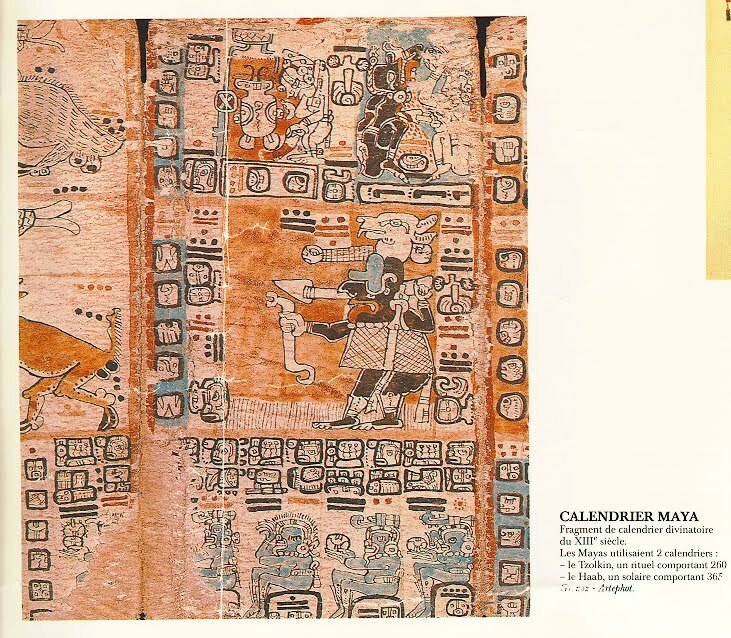 The assumption that the Mayan Calendar supposedly 'runs out' by the year 2012 and that that could signal the 'end of times' as we know it. The scientific theory of an 'Expanding / Contracting Universe'. It was only a few hours later - at twelve midnight to be precise - after I had delivered the shortened version of the speech, that I realized why. It suddenly dawned on me that I could not have brought this up until the Red Magnetic Moon Year had actually started, which is… today (July the 26th 2006) as I'm writing this. During a phone conversation that I had with Louise Taylor (the lady who organized this gathering) she used the word 'unification' and that very word got me to another insight. Over the last generations we have found 'unification' to become a more and more important notion to us. Why is it though that 'unification' feels better to us than, say, 'diversification' or 'fragmentation'? - which includes all of us of course - is preparing for its contracting phase to begin! The speech makes much more sense now, than when I put it together. Here we are, right now! 'a place out of space' perhaps? But, can we really step 'out of time'? Can we step away from space? Are we not always here where we are all the time? We can step away from calculated time - exploited time! We can step away from measured space - commercialized space! And it is the ability to be free in space and time that we are celebrating here now... in a fuller awareness! We were just shown a slide-show of the amazing discoveries of Dr. Emoto, depicting those miraculous water crystals: conscious moments of water as frozen in time. We have just participated in a wonderful Mayan Calendar ceremony by the pond while we thanked 'water' for staying so closely connected and integrated with 'earth', and later on we will be showing our gratitude to 'fire' during the fire ceremony. I would like to donate half a minute of my fifteen minutes with you to silence in dedication to Earth, and while silent, could you, in your mind's eye, imagine how you see our beloved earth, how you feel your concerns about her? How do you consider her past and her future? How do you extend your best wishes to her? I'm sure that most of you here have seen Al Gore's documentary 'An Inconvenient Truth' and I'm sure that many of you have decided to step up their efforts to help our earth to heal herself. We have really come to appreciate being on earth. But that was not always so! Could you imagine, some 75 years ago, that your great-grandmother would be saying to your grandmother, 'You have to ground yourself!' or 'Be Here Now!'? or - if that did not work out - hell or hades. In bible-based religions believers talk about heaven, in Hinduism people talk about escaping the wheel of Karma during their sojourn on earth, in Buddhism there is 'Nirvana can't wait' (except for Bodhisattvas). It seems that over the ages living on earth was not appreciated very much at all! So good that we have come to embrace her. Earth needs our love, she loves our love. And then, there was this science magazine in which Stephen Hawking proposed that humankind should eventually move to an alien planet to 'survive'… and that after he had just complained that we 'd made a mess here and can hardly survive?! Humm…, maybe it behooves us to check out if we ourselves are really not still some sort of 'closet escapist'! Earth wants us here… fully, with all our heart, one Heart at one with one Earth. Could it be that, contrary to what the bible tells us, that we have not been excommunicated from Eden, perhaps we have just been made not to see it. Let's help each other to see Eden here and live it. This brings me to another point, a subtle one perhaps, but a very important one nevertheless, and... it contains a gentle warning. When I was still receiving clients during my counseling practice, I would look out from my window down into the garden and as I would see clients coming through the garden gate, and I would often observe their original (but perhaps latent) energies in the most wonderful colors. I would often exclaim, 'Oh my, look, what a beautiful person!' and I couldn't wait embracing them. Then after they sat down for the consultation I was often caught by surprise when they - almost invariably - spend their first ten minutes trying to convince me of 'in how bad a state' they were, trying to talk me out my first observation. I understand, of course! They had become accustomed to see themselves through the eyes of those who identified them as 'not good enough,' and over time they must have gotten so convinced that those external evaluations and judgments were valid that they started to identify themselves that way also, and... eventually they would 'be' that way. Being their chosen counselor, a function I was given by them when they decided that I could possibly help them, I felt it to be my task to help them to convince themselves 'out of' those initially unwarranted evaluations and identifications, especially those evaluations that tended to come in the form of accusations and judgments - the ones that over time had become the clients' 'own' self-accusations and self-incriminations. Eventually, over the course of a session, a client would discover how innately beautiful and unharmed he or she actually still was after they emerged from under the peeling veneer and layers of off-color faded paints. For most people trying to 'better themselves' is most often no more than picking at their inflicted wounds while they expect that the picking helps the scabs to come off while in fact the wounds get even more inflamed. One heals oneself from within as one recovers one's 'pre-adulterated' human divine being. Sooner or later the veneer and paint will crack and peel away, especially after one sees that the external 'doings' one used to do to 'better oneself' - one's usual ways of dealing with assumed and acquired problems - that those 'doings' actually prolong the problems and even cause them to persevere. Let's for a moment do 'a no-no' and take ourselves out of this place, away from time here, and imagine that we (all of us here together)… that we are a wise and heavenly counselor perched somewhere on a cosmic cloud in the universe. Let's imagine that we see Mother Earth - our first client - approaching us through some heavenly gate, 'Ah, look at her energy' we say, 'and those wonderful atmospheric colors like an aura encircling her, that blue watery veil partially covering her fertile body…' Ah there she is our dear Sister Earth! And we want to listen to her. But… but, lo and behold, we hear only complaints coming from her! Imagine that we are now helping her to convince herself that she is actually how we saw her to be when we first saw her coming to us: so beautiful and whole, energetic, showing her pride in glorious colors... and slowly we see her discover that she is not how she was made to be seen…! And just as a client would wipe away a tear when discovering that she was actually never really as bad or inadequate as she was made out to be, Sister Earth is now also showing a glimmer of a tear, having rediscovered herself…, recovering her real being… not being at all what she was made out to appear. What if our lovely beautiful Earth is actually in good shape - really! - as beautiful as we saw her as she approached us just a few minutes ago? What if our usual human concerns about her are actually our own self-judgments and self-incriminations but projected onto her? What if we, in a way, force her to identify herself with how we constantly identify her, by means of our acquired and mistaken self-identities? If that is so, aren't we then contributing to her lack of self-confidence and thereby actually hampering her self healing? Are we aware enough that Earth can heal herself and that even our most well-meant strategies might not be the right ones, that they might actually prolong her pain? What if our worries about her and the way we usually try to solve those worries, are actually part of the pain we are contributing to the Earth and… that we actually make her pain last longer? Could it be that our 'fixes', however well intended, are also picking at her wounds? I know, that's a novel way of looking at this…, we are so much 'the doer', our work ethic is 'doing', but does our doing actually help Gaia (as Dr. Lovelock called the earth)? Really? Is Earth actually OK while instead we think her to be so ill? Is part of our thinking not actually part of our illness…, which we are pushing onto her? What good do we actually do to Earth even when we think we 'do good'? Ah Mother Dear! The things we do, eh?! Can we heal the earth, when we actually fight those whom we see as hurting her, while we are thus engaged in a futile game of mutual pain? We do that sometimes, don't we?! We can be so unaware, hating those who do the hating. Gandhi's approach might still be the right one: he dealt with Mother India's liberation by increasing her self-confidence by improving that of her inhabitants. we can let go of our syndrome. There is a theory that says that currently in our expanding universe, everything expands… that means 'us to'. That theory also states that the universe will at some point start contracting. Could it be that the universe is starting that contracting phase right about now, and that survival starts meaning something else than what it used to mean? less of me, less for me. In a contracting universe there will be less time, less space… maybe that is why this particular 'day out of time' in this 'place out of space' is so significant! 1 Aren't our sick even living longer, and in spite of starvation of millions, don't more billions of us actually live on earth and that even to an older age?